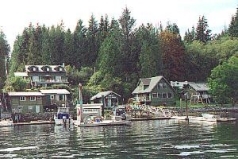 Voted one of the ten best "towns" in Canada to visit by travel writers (as published in Harrowsmith Magazine), Telegraph Cove is tucked away on the eastern coast of Northern Vancouver Island in one of the last virtually untouched areas of the North American continent. 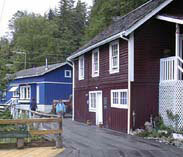 This tiny sawmill and cannery community was important to the development of the North Island and has a rich and colourful history. We offer a wide range of ways to unwind. From a quiet, harbour-view reading nook, to the thrill of our deluxe offshore fishing adventures, Cheryl and Brian have created a place that promises to meet your individual expectations of R & R. McKay Bay Lodge takes pride in its ability to customize your vacation.